How to get a fair and lovely face for matrimonial purposes | It's a Miracle! As reported in The Great Beyond, in December 2010, the Department of Science and Technology of India, in its infinite wisdom decided to sponsor an award with Proctor & Gamble to be given to the research team which can come up with the best skin-whitening agent. To win, the skin-whitener must be safe to use on humans and more effective than hydroquinone, a chemical banned in many parts of the world (but oddly enough not in India). Clearly, the complexion of the dark-skinned natives of the country is of paramount interest to the concerned government. Yet this award is only indicative of a broader mindset pervasive across our subcontinent. And don’t worry if you’re unhappy with your face. As your trusted friend, I will guide you on the process of using software to get the right one for maximum matrimonial potential. At the outset, let me describe my own complexion. To use two popular complexion-delimiting Bengali similes, I am neither as white as drops of red alta in milk, nor am I as dark as ebony. I could be described in the lexicon of matrimonial ads as either wheatish or olive-complexioned depending on the lineup I’m compared against. Not to put too fine a point on it, but my complexion along with my generic facial attributes has often resulted in beholders thinking I’m North Indian, South Indian, Pakistani, or Bangladeshi depending on the context of the interaction. In many other countries, Europeans want to get a nice tan. A study by a group at the University of Nottingham found that a tan skin-color from eating carotenoid-containing vegetables was found to be more attractive than that from sun-tanning and more attractive than the fair original. I’m not sure what would happen if that same experiment had been performed in India but we are all about fairness (at least with respect to complexion). Suntanned face, fair face, and "carotenoid" face, respectively. Courtesy of University of Nottingham. Ian D. Stephen, Vinet Coetzee, David I. Perrett. Carotenoid and melanin pigment coloration affect perceived human health. Evolution and Human Behavior, 2010. In the days before digital photography, there were fewer tricks for complexion whitening. You were dealt a particular genetic hand; post-birth you avoided the tropical sun and added copious amounts of turmeric paste to your face. In the best case scenario, you only looked somewhat jaundiced. Photography made life a little easier. In the days of black-and-white stills, you whitened your face like a pancake with talcum powder. The trick back then was to make sure that you buffed all photographed skin: many a dark-skinned impostor was exposed by a visible fault line between the face and the neck due to inadequate attention to this important aspect. As color photography became popular, it became harder to conceal the birth-complexion. High-watt halogen lights as well as overexposure of 35 mm color film by a hand deft gave some of us an edge in looking fairer. Now with digital photography, you not only have the opportunity to lighten your complexion, but also to change your facial attributes and your gender. Let us start with the shape of your face. 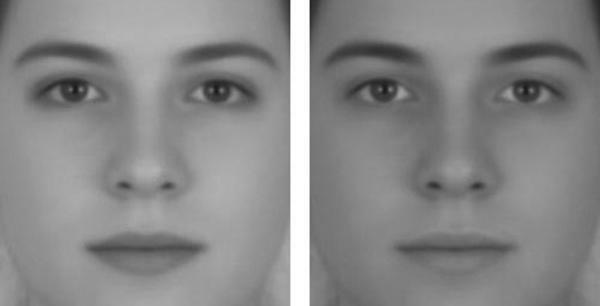 Most people of either gender like symmetrical faces. If you broke your nose playing cricket or have a lazy-eye you can ‘”normalize” using image-editing software. But most of us have symmetrical faces. We just want to “touch-up” a little here and there. A research paper published in Vision Research claims to shed light on the “golden ratios” for facial beauty. The authors took a color photograph of a Caucasian female and used Adobe Photoshop to increase and decrease the distance between the eyes and and mouth, and also the horizontal distance between the eyes. The authors claim to have discovered a so-called “golden ratio” for facial proportion. 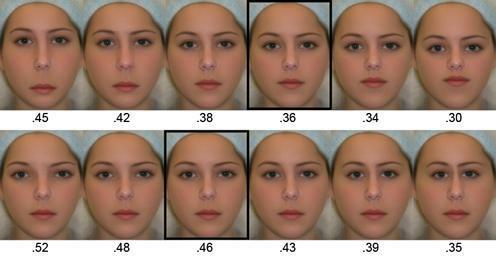 When altered images were shown, participants found the woman in the picture most attractive when the vertical distance between the eyes and the mouth was 36% of facial length, and when the distance between the eyes was 46% of facial width. Once you’ve taken digital photographs that show you in the best possible light, you need to use the scale tool to measure your facial proportions. If the proportions do not match the golden rule, don’t fret. Just use the editing options to digitally modify them so they match up to the 36% and 46% mentioned. But researchers haven’t stopped at the golden ratio. By asking people which faces they found more attractive and feeding this data into a computer, they’ve created a “beauty machine” which does all the calculations and alterations for you. In an instant click, your homely face can become a “knockout”. Once you’ve enhanced your facial profile, you’ll need to deal with your complexion. Play around the with the color balance, and the hue/saturation until you get the desired color profile. A recent study has shown that female faces have greater contrast between the eyes and lips. If you’re a female, you have greater leeway in using the brightness and contrast tools. If you’re a male, as you start to increase the contrast, you’ll start to look more like a woman. 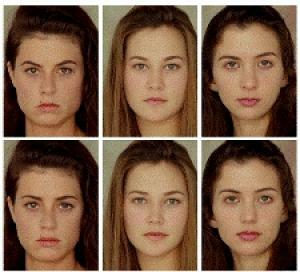 Looking like a woman isn’t necessarily bad facial attribute for guys. Recent studies have shown that women actually prefer men who look somewhat feminine to those with the more rugged masculine mugs. I do, however suggest that you grow some facial hair if you’re going to turn the knob full-circle on the contrast. In short, there are many ways to digitally modify the way you look to resemble the way you think you should look. You can change yourself digitally without the need for skin-whitening creams. And unlike plastic surgery there are no costs, sharp knives, or permanent physical scars. This is indeed a valuable service you are providing unconventionally ugly people (& since I am dark-skinned, like you, I fall in this category). Jokes apart, seriously shocked about the DST and P&G’s award…ridiculous. The award was for a measly sum of 1000 dollars. I’m not sure what it was meant to achieve for the government. What it did get them was a lot of bad publicity. Or you could choose a partner who doesn’t care about your complexion and boycott skin-whitening creams.